A new release in this incredibly popular and enduring series featuring scenes from Wales. Combining beautiful scenic footage from Wales with vibrant live worship recorded at the Keswick Convention, perfect for small groups and mood setting. Easy to use song selection menu with an option to show the lyrics of each song and hymn as it plays. Running time approx 40 minutes. Precious Moments DVD vol 5: Amazing God: Scenic footage from Wales by Various Artists was published by Essential Christian in December 2011 and is our 9368th best seller. The ISBN for Precious Moments DVD vol 5: Amazing God: Scenic footage from Wales is ELE1610A. 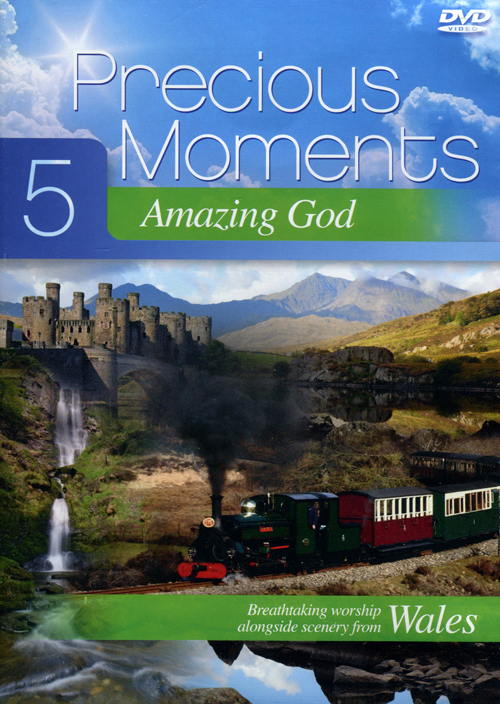 Be the first to review Precious Moments DVD vol 5: Amazing God: Scenic footage from Wales! Got a question? No problem! Just click here to ask us about Precious Moments DVD vol 5: Amazing God: Scenic footage from Wales. What region is this DVD please? A:This DVD is produced in multi-region format and will play on all standard machines worldwide. What hymns are featured please?